Various members of international organizations, financial institutions, and dignitaries at the opening ceremony. 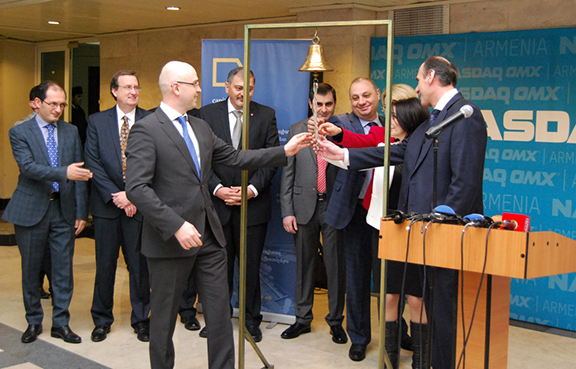 YEREVAN — During an official ceremony on January 27, NASDAQ OMX Armenia marked the successful launch of the first securitized bond issuance in Armenia and announced the listing of these bonds at the stock exchange for the secondary market trade. This landmark transaction was made possible through the joint efforts of USAID, Capital Investments, and universal credit organizations. In attendance at the event were U.S. Ambassador to Armenia Richard Mills, Deputy Prime Minister and Minister of International Economic Integration and Reforms Vache Gabrielyan, Deputy Chairman of the Central Bank of Armenia Vakhtang Abrahamyan, CEO of NASDAQ OMX Armenia Konstantin Saroyan, CEO of Capital Investments Tigran Karapetyan, as well as representatives of international organizations and financial institutions. “This event is important most of all because it will make more funds available for the development of rural areas – to help farmers expand production and entrepreneurs start businesses in rural villages – and for consumer loans. The first securitized bond issuance in Armenia is also an opportunity to support new financial products in Armenia. This new type of financial product combines many development initiatives that we have pursued over the years – all focused on making more funds available in the credit system for the development of rural areas,” said Ambassador Mills. While the microfinance industry is well established in Armenia, it cannot currently service micro, small and medium enterprises (MSMEs) properly due to the lack of lending capital. Microfinance institutions, such as universal credit organizations (UCOs), are not allowed to take deposits and this further limits their ability to extend credit to MSMEs. USAID, through its Finance for Economic Development (FED) project, worked with five UCOs – CARD AgroCredit, Garni Invest, Global Credit, Kamurj, and Nor Horizon – to help them issue bonds to attract lending capital. USAID assisted with the design of the initial bonds through close coordination with the Central Bank of Armenia, UCOs, and USAID’s Development Credit Authority experts. U.S. Ambassador to Armenia, Richard Mills Speaking at the Opening Ceremony. The bonds were issued by a newly established special purpose vehicle, the Loan Portfolio Securitization Fund I. Managed by Capital Investments, the Fund was established in August 2015 with the purpose of securitizing the $2 million worth microfinance loans of the five participating UCOs. 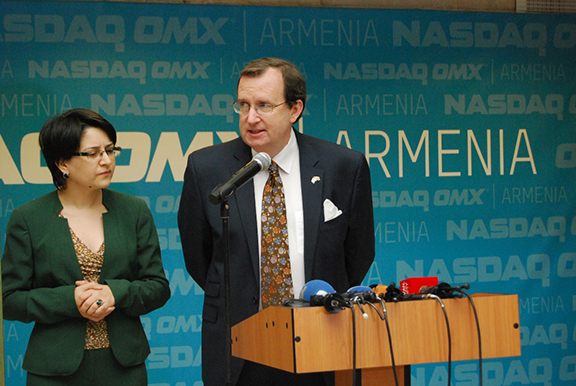 The Securitization Fund is offering the bonds publically on NASDAQ OMX Armenia. To make this investment attractive and relatively risk-free for bondholders, a USAID Development Credit Authority (DCA) guarantee was issued in late November 2015 to cover 50 percent of the bond’s principal. Primary bondholders include pension asset managers and several banks, among other financial institutions. The bondholders are collectively represented by a legal agent approved by USAID, as a guarantor for the transaction. USAID’s Development Credit Authority (DCA) works with investors, local financial institutions, and development organizations around the world to design and deliver investment alternatives to mobilize local financing for U.S. Government priorities. To date, the DCA has helped mobilize up to $4.3 billion in financing in 75 countries across 473 transactions.